If you’re a regular follower of my blog, you know I live in jeans (as seen here, here, here, here, here, here, here, here, here and…). You might even say I’m obsessed. I’m also lucky that the Advertising biz is pretty casual in terms of a work wardrobe, so jeans are an everyday staple. That being said, I’m always on the hunt for special details that up my denim game. And these patchwork cropped jeans immediately caught my eye. At last count, I’m up to about 20 pairs of jeans. Does that qualify as an obsession? (My husband would say yes.) 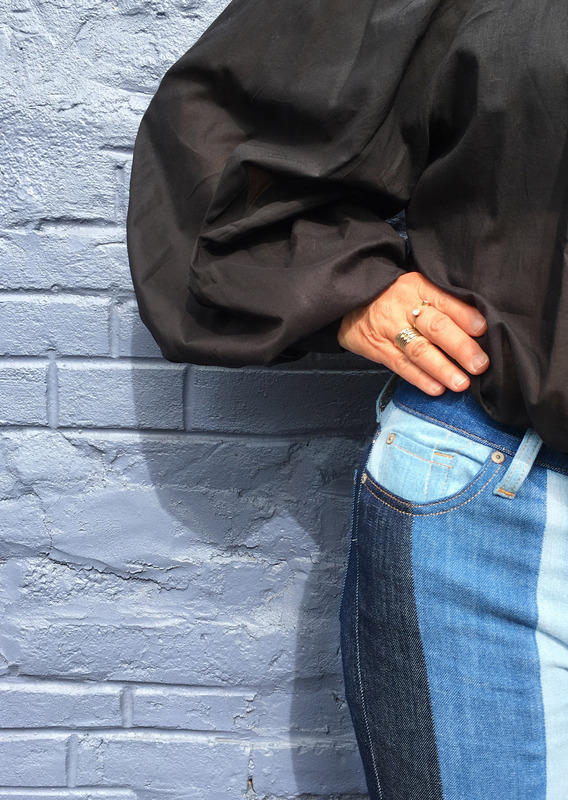 I’m hoping to edit my collection down, especially as I refresh my wardrobe with new finds like these cropped flares. Initially I worried that they were too busy, but the fact that the patchwork is vertical really is lengthening and flattering. And c’mon, these are just too fun! Because I (really, really) try to adhere to the “what could I wear this with” double check before I make any fashion purchase, I was already thinking about this striped Balenciaga shopper tote. A splurge from a few years back but as you can see from this, this, and this post, an eye-catching accessory that’s stood the test of time. And…they look made for each other without being matchy matchy. 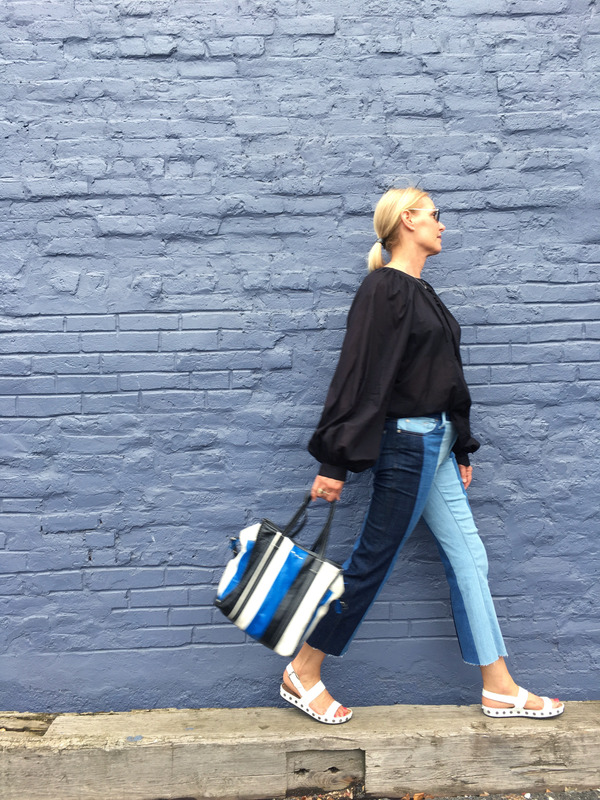 The stripes on this shopper tote inspired the rest of my look — a billowy black top and subtly studded white sandals (but the suede espadrilles from this post would have been a great choice too). 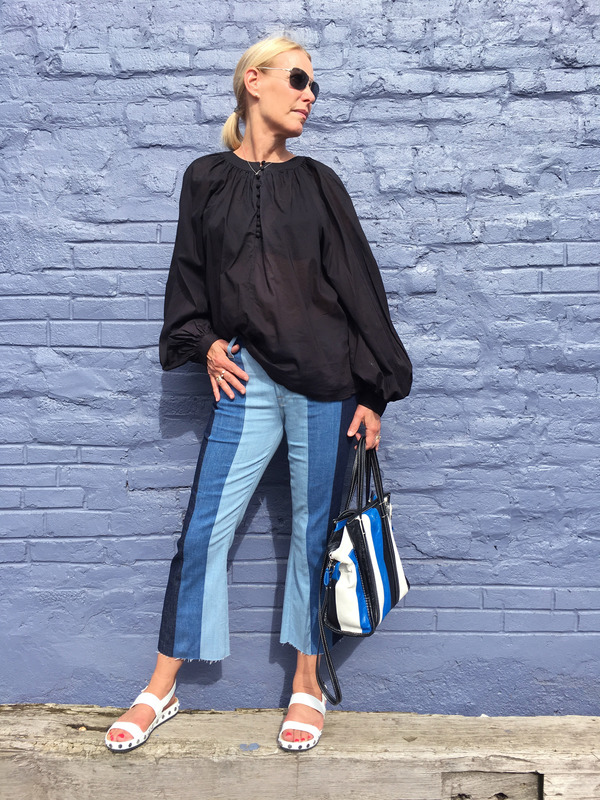 This balloon-sleeve top is right on trend and also a great transition piece — easy and breezy for the last week’s of summer, as well as those first weeks of fall. It would look great with white or black jeans, too. And once sandal weather is over, I plan on swapping in black or white booties. How about you? Do you live in jeans too?? Jeans: (7 For All Mankind, on sale but limited sizes) Similar vibe here and here (also on sale! lots of sizes!!). Top: (H&M, on sale but almost sold out in black. Full size range in white.) Also like this and this (cool new designer!). Bag: (Balenciaga, also available in other stripe combos). More affordable options here and here (borrowed from the boys and why not?). Sandals: (Rebecca Minkoff, old) Love these, these and these (super steal!) as alternatives. Photos & Film by Kristin Moore-Gantz. Thanks! A bit of brain kismet!! 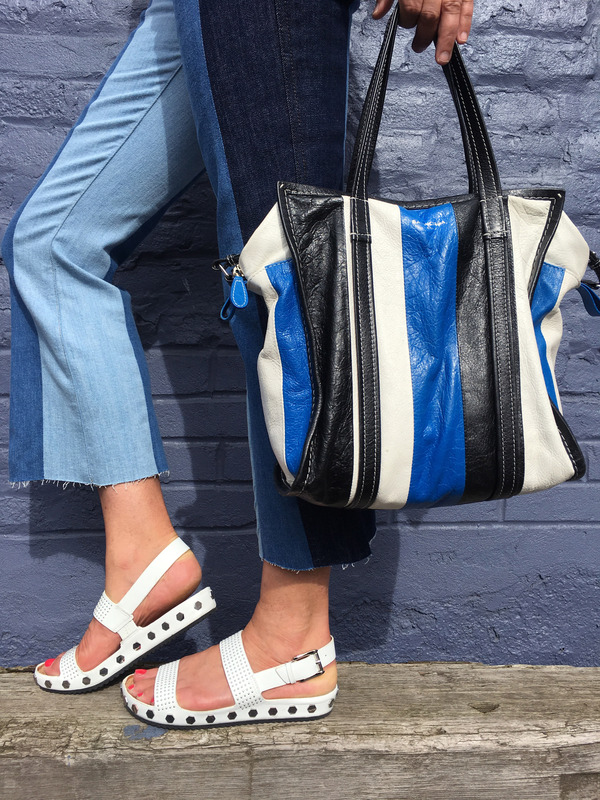 A really fun approach to jeans – makes me smile! Thanks! So glad you enjoyed it!! Was fun to shoot too!!! The outfit is so cool and I really like the jeans!